It’s mid-February, and while it might still seem like a far off oasis, summer is rapidly approaching. Our current strength athletes just finished up a squat and bench cycle developed by Gayle Hatch, which focused on increasing those lifts specifically and improving barbell movement and mechanics. 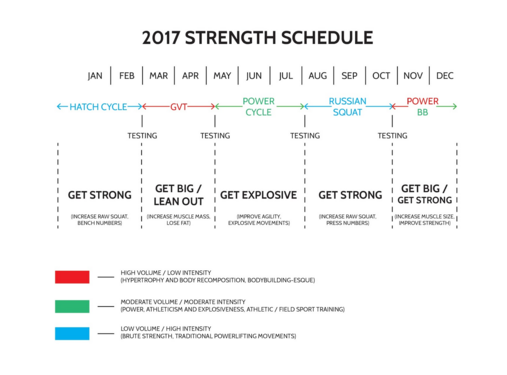 While Strength Classes are always focused on strength (duh), we tend to vary our cycles throughout the year to create different stimulus and produce different desired outcomes. Below you can see your plan for the remainder of 2017 – and how each cycle differs. As you can see, we are moving into a cycle that is low in intensity and high in volume (lower weights, higher reps). This is an extremely effective program for achieving the holy grail of almost every fitness program out there – burning fat and building muscle simultaneously. The price you will pay to sip from this proverbial cup is nothing short of pure, unadulterated effort. This program is NOT for the weak at heart – athletes will be performing between 200-400 reps PER TRAINING SESSION. Compare this to the Russian cycle (which was done a few months ago), which had around 400 reps TOTAL for the entire cycle, you will quickly see this is an entirely different beast. The objective is not the pounds on the bar, but rather the burn in your muscles. Athletes will perform between 8-10 sets of 3-4 exercises, each with a rep goal of between 5-10 per set. The weight will necessarily be light, and so will the rest – we are aiming for about 90 seconds between sets. You should never hit failure. It’s sort of like Strength Class will become one long, drawn out metcon meant to induce muscular hypertrophy (get bigger muscles!) and burn fat (show them off!). This cycle will have a three-week “ramp up” period, where we will slowly increase our volume to acclimate our bodies to the increased workload. It is imperative that if you wish to do this cycle that you make an effort to come to these first three weeks. You are going to be putting pretty significant strains on your body; make sure you fuel appropriately. Reduce normal CrossFit Class attendance slightly. The volume of these workouts will leave even the most seasoned athlete sore and fatigued; make sure you take it easy and take plenty of days off to recover appropriately. If you wake up feeling like you can’t move and are scheduled to train, perhaps that’s a sign to either 1. Throttle back, or 2. Take a day off. Be sure to communicate your personal physical status to your coach. Don’t be afraid to modify reps/sets. 10×10 too much? It probably is for most athletes. Feel free to knock that down to 8×10, 6×10, etc. – again, refer to your coach for specific individual questions. This is a fantastic and exceptionally effective cycle, but it demands a lot of the athlete – both in class and outside of it recovering. You will reap great rewards if you dedicate yourself to the hard work and recovery necessary for success. Any questions? Email Mike Hara at michael.j.hara@gmail.com. Happy training!